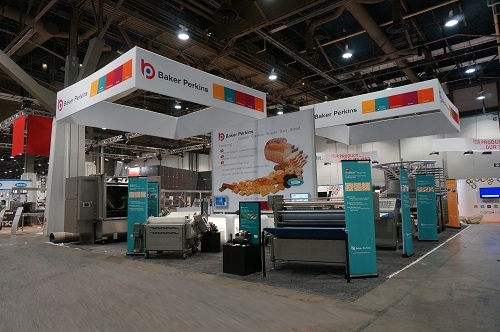 Baker Perkins introduced a new concept offering superior levels of performance, choice and hygiene in the production of frozen dough for soft cookies at IBIE 2013. Baker Perkins is the market leader in technology to produce this favorite take-away treat, baked at the point-of-sale. The new concept is based around a Baker Perkins TruClean™ wirecut with a series of standard modules for topping and paper handling. It replaces the range of special-purpose frozen dough machines with a system that is much more flexible and hygienic. The TruClean™ wirecut is the result of radical innovation in Baker Perkins’ approach to hygienic design. It brings the freedom from allergens and other cross-contamination issues essential to frozen dough producers, who have no control over the baking of their product. Three additional modules are available for topping, paper cutting and paper slitting and these are combined to create up to six versions for each width. The two industry-standard choices of bulk packing or depositing onto paper are both catered for. On machines below 32 inches, a device cuts a paper roll into sheets of the appropriate length; on machines of 32 inches and above, the paper is slit and cut. Each choice is available with an optional topping and sprinkling unit. Working to industry guidelines on sanitation, every detail of the TruClean™ wirecut has been engineered to minimize accumulation of debris and to make thorough and effective cleaning as easy as possible. The new design uses the same well-proven process as previous generation Baker Perkins wirecut machines, and offers the same outstanding weight control of +/- 1-2% on plain dough. For products with inclusions, cutting consistency and deposit accuracy can be improved with an oscillating knife. Less time spent cleaning means lower costs and faster changeovers. Exceptional reliability, low waste and minimal giveaway enable high production rates to be maintained while keeping operating costs low. Frozen dough cookies come in a range of sizes and flavors in most types of soft dough. To add value, inclusions are easily added.